Today marks the beginning of the 15th annual La Ruta Maya River Challenge, one of the world’s great river races tracing a 175 mile ancient Maya river trade route through Belize, and, according to Belizean eco resort Chaa Creek, a valuable way to raise awareness of the need to safeguard Belize’s pristine waterways. The La Ruta Maya race is part of Belize’s annual Baron Bliss Day Celebration, a national bank holiday named after an eccentric wealthy Englishman who fell in love with Belize . 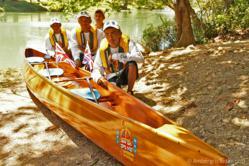 Today marks the beginning of the 15th annual La Ruta Maya River Challenge, one of the world’s great river races. The Lodge at Chaa Creek, which has been promoting environmental sustainability in Belize for over 30 years, has been a long-time supporter and enthusiastic participant in La Ruta Maya. So passionate, in fact, that owners Mick and Lucy Fleming sent a staff member to Canada to learn canoe building from Ted Moores, a master canoe builder of Bear Mountain Workshop in Ontario, and now produce their own handmade timber canoes. During last week’s visit to Belize, Prince Harry christened a new Chaa Creek canoe, The Queen Elizabeth II Diamond Jubilee, for a British High Commission entry in the race. “We enjoy the race for the sheer competitiveness and the fact that it brings so many Belizeans together for the three days it runs. But for us, an important aspect is that it highlights the beauty of Belize’s pristine river system and, hopefully, that leads to a greater understanding of its fragility and the need to continually work towards protecting all of Belize’s waterways,” Mr Fleming said. The race begins today in San Ignacio town in western Belize’s Cayo District, near the Guatemalan border. The colourful, exuberant start always involves competitors – and spectators – getting drenched with water as canoes splash and tip throughout a sometimes chaotic early morning start. The crews then battle for station prizes along the way as well as a cash prize at the end of the race. Today, Day One, the canoes will set the pace with a gruelling paddle some 49 miles to Banana Bank, where they spend the night amid a carnival like atmosphere. Tomorrow will see the intense 60 mile leg to Bermudian Landing and an even bigger party, followed by a 36 miles run to Burrell Boom for the last night’s rest before the 25 mile frantic dash to Belize City, finishing under the Belcan Bridge. Now in its fifteen year, the La Ruta Maya coincides with the national holiday of Baron Bliss Day, named in honour of a wealthy English sailor who fell in love with the former British colony while visiting aboard his yacht. Even though he never actually set foot on land, Henry Edward Ernest Victor Bliss left a fortune said to have been some two million US dollars in a trust fund to benefit the people of Belize and is buried in a granite tomb at the foot of the lighthouse that bears his name. Mr Fleming, who was part of the Chaa Creek team that won the Master Class in 2002, said he is looking forward to seeing how the Chaa Creek canoes do this year, and has been encouraged by the strong commitment to river conservation the race organisers have shown again this year. Day-by-day race results will be posted on the Chaa Creek website, he added.